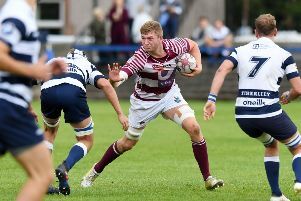 Some astute recruitment means Edinburgh Accies will start the BT National Division One campaign among the favourites for promotion. he return of back rower Robin Snape and a new half-back partnership of Sam Johnson and Richard Mill bring an experienced spine to the side, and coach Derek O’Riordan will be hoping they can create a platform to unleash the pace lurking behind the scrum. O’Riordan conceded his side were not quite ready for promotion last season when they lost the play-off against Hawick. However, the affable Irishman will have high expectations this time, as Accies start the league programme with a trip to face neighbours Stewart’s Melville, with silverware at stake in the shape of the Gavin Calder Memorial Cup in honour of the Inverleith club’s former president who died earlier this month. StewMel coach Gordon Henderson’s squad has been strengthened by the return of scrum-half Andrew Manson after a year in Canada, and prop Ruaridh Mitchell, who spent last season at Heriot’s, as well as several new faces including former Preston Lodge winger Nathan Ross, who scored on his competitive debut in the BT National League Cup win last Saturday. Also looking to be involved in the top half of what promises to be a fiercely contested league will be Musselburgh. The Stoneyhill men are now in their third season since earning promotion and, with a settled squad that boasts several hardened campaigners and a string of promising youngsters, will go into Saturday’s opener at home to Selkirk buoyed by an impressive cup win last weekend. Newcomers Colin Arthur and John Coutts both have top-flight experience, while Burgh will also have the services of Ruaridh Young who has rejoined his first club on a dual registration arrangement with Currie Chieftains.